Who else loves Mexican street corn? I know I do! 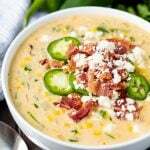 I’ve taken all those delicious flavors, added a few, and made it into a delicious soup that is absolutely killer! 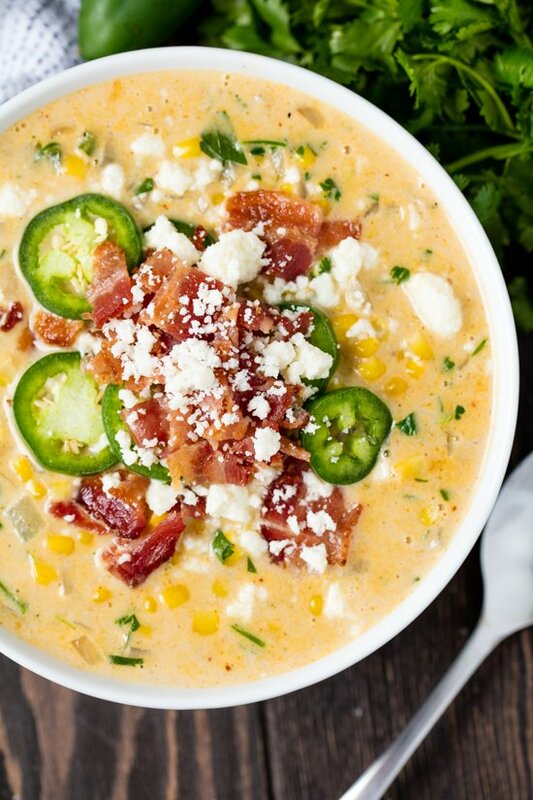 It’s hearty, full of corn, and topped off with bacon, cheese, and jalapeno. What’s not to love? 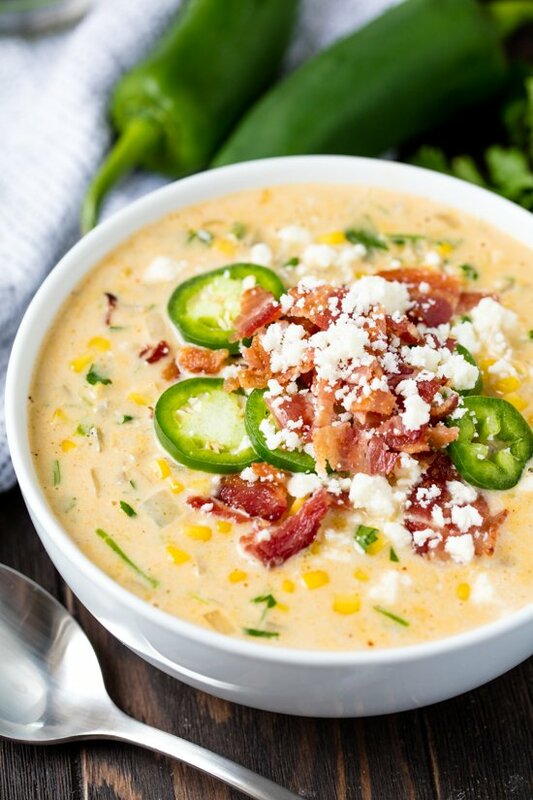 Not only is this soup absolutely delicious, it’s also really easy to make. It’s read in under 20 minutes! I have a feeling you’ll be making this soup over and over and over again. It’s easy for this one to become a family favorite! What is Mexican street corn (Elote)? Mexican street corn, also known as Elote, is grilled corn that is lathered in a mixture of mayonnaise, sour cream, cotija cheese, chili powder, garlic, and cilantro. How much flour do you need to thicken a soup? When you want to thicken a soup or stew, use equal parts flour and fat. The flour needs to be mixed into the fat directly for best results. This allows it to evenly disperse into the liquid once it is added. If you’ve already added your liquid and you want to add additional flour in to thicken your soup, whisk your flour into a small amount of the hot liquid in a separate bowl. Once you have a liquid slurry, pour it back into the soup over heat and stir until thickened. If you liked this recipe you may also be interested in my recipe for Authentic Carne Asada. It’s one of the most popular recipes on my website. If you like Mexican flavors, you can’t go wrong with Carne Asada. Watch the video below where I walk you through every step of this recipe. Melt the butter in a large saucepan over medium high heat. Add in the onions and minced jalapeno and sauté for about 5 minutes, then stir in garlic and cook an additional 1 minute. Stir in the flour, cumin, and chili powder and cook 1-2 minutes. Whisk in the chicken stock until smooth and bring to a boil. Add in the corn, sugar, and salt. Once it returns to a boil, reduce the heat to low and simmer 10 minutes. Stir in cream and cilantro. 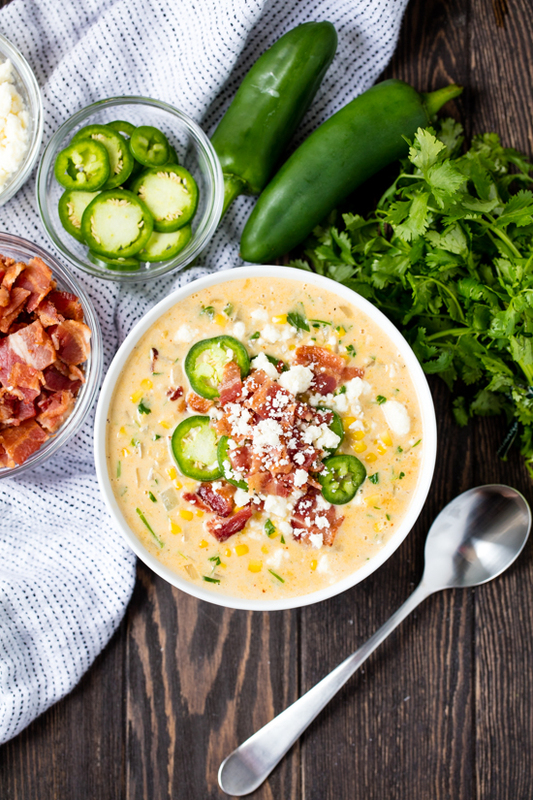 Serve topped with crumbled bacon, cotija, and jalapeno slices. This was super easy to make and oh so delicious! Thank you! This was really, really tasty and oh so easy. But, if I made again, I would cut down on the amount of cream. I thought it dulled the flavor a little. I added shredded chicken and I was short 2 cups of the corn, but it turned out amazing. I used precut jalapeños from the produce section. I felt they were lacking in spice because there were no seeds. Next time I make I will add more jalapeño and leave some seeds to add more heat. I am home recovering for surgery and fancied something tasty. Hi! This was WONDERFUL!!! I added 2 serrano chilis to the jalapeno that was sauteed with the onion, and used 2 full heads of garlic mashed. I did not use a fresh jalapeno for garnish, or the cojita cheese, or the bacon. I also omitted the sugar and added extra salt. I threw in 1/2 cup of store bought mashed potatoes and 1/4 cup green onion cream cheese because I thought they would be good in there. I loved it!! Thank you so much. I could tell the recipe would be amazing as is 🙂 I am trying to rate it 5 stars, but the star thingy isn’t working. I am a stay at home mom who cooks every day. I’m pretty picky about the quality of recipes I prepare for my family. This one is amazing and I’m going to make it for the second time today! This time, however, I am going to fire roast the jalapeno before adding it into the recipe. We converted this to a vegan recipe. It’s delicious and definitely a keeper! Look delis and will try it as I really like all the ingredients. O so can’t wait to make this!!! Thank you so much!